Inside the swelling on this leaf petiole is a colony of woolly aphids. By mid spring these galls are very evident on Fremont Cottonwood (Populus fremontii). The aphids are concealed inside the gall. Observed at Fish Creek, Maricopa Co., May, 2009. The woolly aphids that live inside this gall are nearly immobile and quite vulnerable to predaceous insects and to weather hazards. But inside the gall they are relatively safe. The aphids feed by means of a narrow proboscis that is inserted into plant tissue and is used to extract watery sap. Woolly aphids use the excess sugar in the sap to produce and coat themselves in filamentous wax making them appear white. With no sharp mandibles how did these bugs get inside the petiole - the short stem that attaches a leaf to the plant? 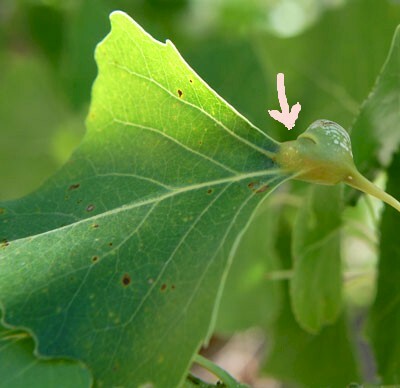 The slit visible on the gall (arrow) offers a clue. When the aphid colony was first established there was no swelling and feeding was on the exposed surface. The aphids introduced irritating chemicals that served to direct cell growth in the developing tissue. Cells lengthened and because surrounding tissue had stopped growing the expanding tissue forced a blister to form around and over the aphids. Thus the aphids are not actually inside the stem, merely on the surface as the plant formed a roof over their heads in response to their feeding activity. There are quite a number of gall-producing aphid species, most of which are specific to their host plants. Separating one kind from another requires a good microscope and taxonomic expertise.